Problem C11: A fish is traveling with a speed of vfish=v/n3 towards an underwater cliff. Here v is the speed of sound in water. 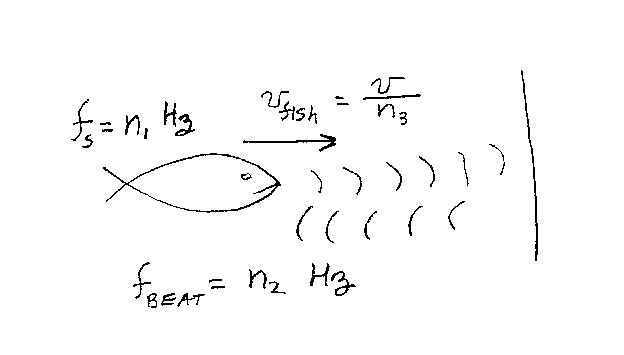 The fish sends out a tone with frequency fs = n1 Hz. The sound reflects off the cliff and the fish hears the beats that the reflected sound makes with the initial tone. If the beat frequency is n2 Hz, what is n3? Note that n1 and n2 have units of Hz, and n3 is unitless.